Last night we had hamburgers for dinner because Fred Meyer didn’t have any good looking fish. I’ve been wanting to start a “Friday Night Fish Night” tradition to get more fish into our diet, but it’s hard when the local megamarket doesn’t have anything worth eating on Friday afternoon. We just bought a side of beef from a local meat company, and have some older frozen hamburgers in the freezer to eat before our all-natural Alaska meat shows up next week. 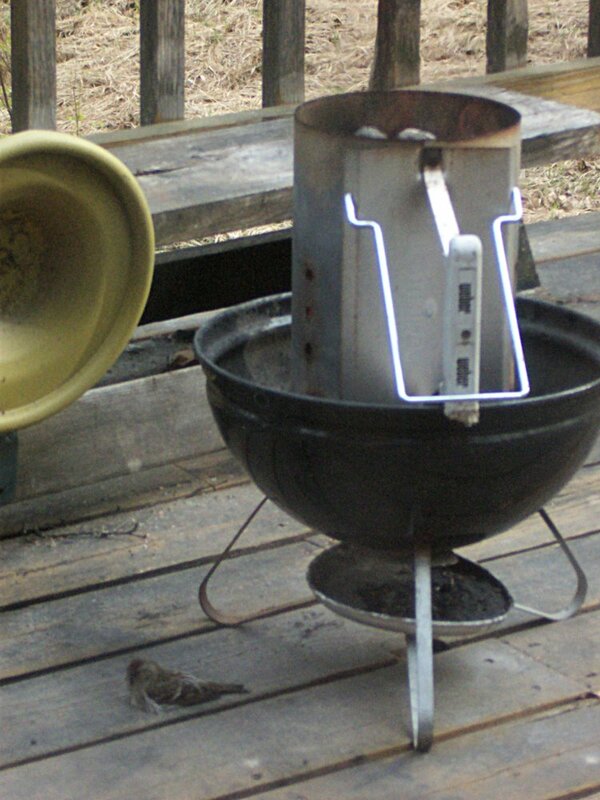 I use a chimney starter to get the coals going (it’s the silver tube sitting in the little Weber in the photo), and it must have been throwing off enough heat to warm up the redpoll in the photo. He’s in the lower left. He laid there for at least five minutes warming himself by the heat from the coals. Redpolls don’t appear to be all that smart (they’re called “pigpolls” by bird feeders around here), but this one really knew what he was doing. Click on the photo for a larger, and still fairly grainy image. 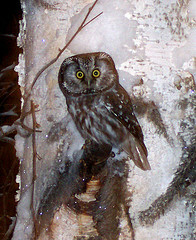 A few days ago we had this little guy show up at the tree nearest to our house. The photo was taken by my wife, standing about four feet away from it. We've got a whole bunch of bird feeders all over the deck, and we think the owl was probably harvesting voles that come out to eat birdseed that makes it to the ground. We often see a flying squirrel occupying the same perch on that tree, but he's been absent for a few days now. You can see larger versions of the photograph at my wife's Flickr page.